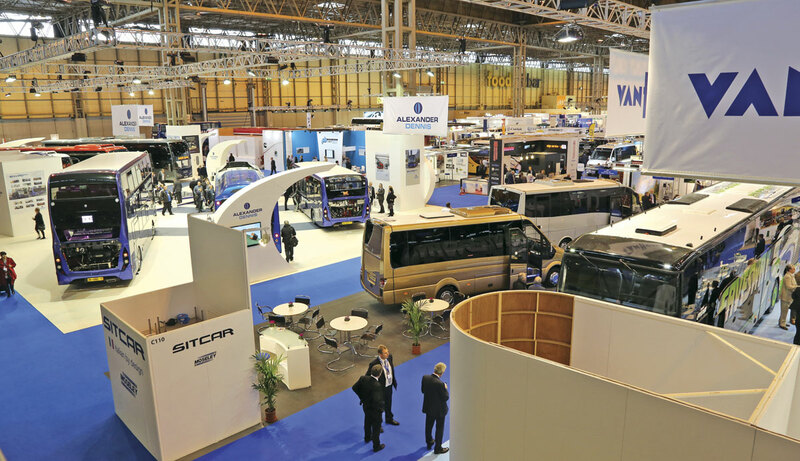 Those manning the stands may not agree but for me last week’s Euro Bus Expo event flashed by. 16.30 on Thursday afternoon came round in no time and there were still things I’d wanted to see that I hadn’t got round to. The Bus & Coach Buyer team was out in force, with Rob Orchard kept very busy covering the huge number of developments in the mini and midi coach sector, Chris Peat looking at products and services, me covering the larger vehicles and Dave Cole taking pictures and filling in the gaps with the help of Kirsty Flatt. It has provided plenty of copy for this week and a fair amount for next week too. Having already attended the shows in Hanover and Madrid in recent weeks, and heard about those in Rimini, Paris and Stockholm, I was pleasantly surprised how much new product there was to see, although the fact that none of the others concern themselves with right hand drive is a factor here. Another is that, despite the seemingly endless tide of consolidation and globalisation, the UK remains a significantly different market to any other and the buses and coaches used here reflect the different approaches. It was effectively the first proper Euro6 show in the UK, again very different to most of the European markets which acted more quickly on implementation. With the new engine generation have come model changes from the key UK based manufacturers and these really raise the bar in terms of innovation. ADL, Wrightbus ad Optare all stressed the importance of the home market to their businesses while at the same time illustrating the growing importance of exports to their futures. Offering tangible benefits is going to be important because, as the presence of two additional Chinese manufacturers showed, there are an increasing number of potential competitors shaping up to take the UK market seriously. 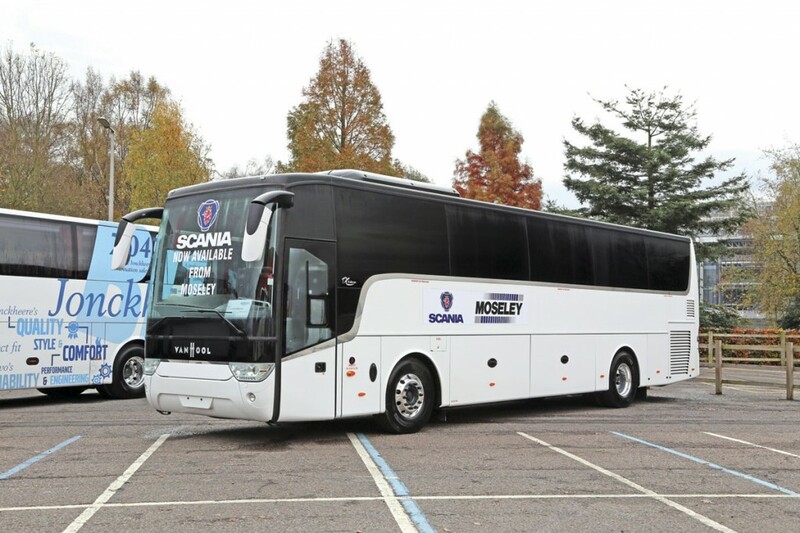 On the coach side old alliances are changing as the Moseley and BASE line ups showed, with additional European manufacturers appearing in the UK for the first time. The biggest variety of new coach product, possibly unsustainable riches in the long term, is in the mini and midi sector (up to 10m), which Rob Orchard has looked at in a separate article in this issue. Speaking at an 08.30 press conference, CEO Colin Robertson said that the UK bus market was running at approximately 10% below 2013 levels though ADL remained the clear leader with a 42.5% share. For ADL the figures were somewhat skewed by a major export build programme in the first half of the year and there would be increased UK volume in the second half. Coach volumes were up 25% to 250 units, including exports. Saying that the UK remained the bedrock of the ADL business, he pointed out that in 2008 70% of income was UK derived whereas today half of the £550m turnover was derived from exports, a figure that would increase. 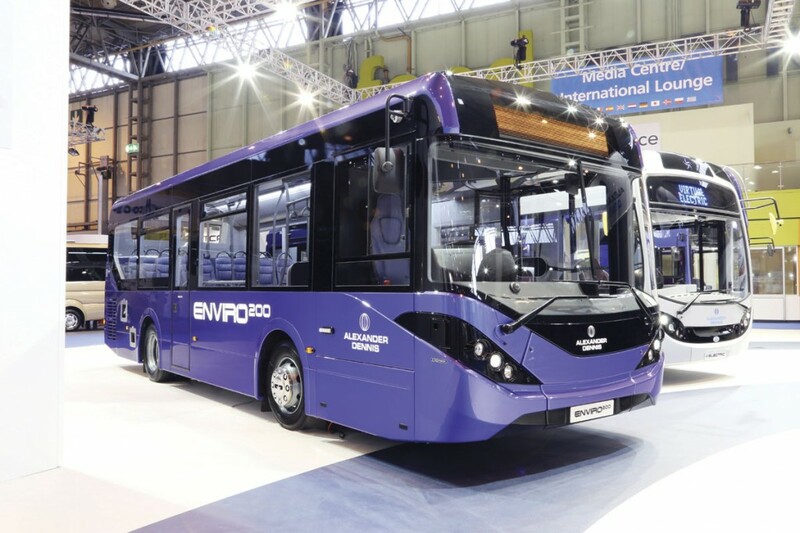 Making its debut at the show was the new Enviro200. It is to be made available alongside the existing Enviro200 model which is already offered with both Euro5 and Euro6 engines. Weighing 200kg less than the current model, the latest version comes with a host of improvements, the most visually obvious being a completely new smoother front with a slightly asymmetric wrap round screen that improves the view for most drivers by 24%. Key benefits include increased seating capacities across the range and more forward facing seats. These capacity increases (which vary between two and five seats according to the length of the bus) have been achieved by making the E200 one inch wider overall which creates two inches of additional interior space (no wonder it was painted a similar colour to the Tardis). 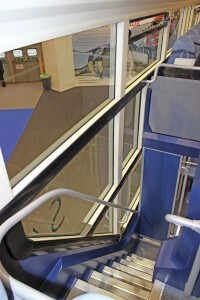 The frame sides are perpendicular to the waistrail and then cant in at a one degree angle, enabling a double seat to be fitted over the front wheelarch and creating space for an additional double seat in the low floor area. The front and rear suspension systems are new featuring a four bag system to improve the ride. There’s a lot more to be said about it but there isn’t room within this article. Based on the genuinely fully low floor Enviro350H, the Virtual Electric single decker displayed next to the Enviro200 brings with it the opportunity to run in emission free mode for up to 80% of an operating cycle, using a pre-programmed GPS tracking system to identify where the diesel engine should be shut off. Topping up can be achieved quickly en-route using an inductive charging system. Launched some months ago this was nevertheless the first time the new Enviro400 double deck had been displayed. It incorporates over 200 improvements over its predecessor, carries more passengers and is 17% more fuel efficient. Many of the revolutionary features it brought with it, such as the QRG quick release glazing feature that is now fully patented, the cab and the electrical system have been carried over to the Enviro200. To date over 400 of the new model have been ordered. Next year will see the launch of the first Virtual Electric versions on TfL’s route 69. 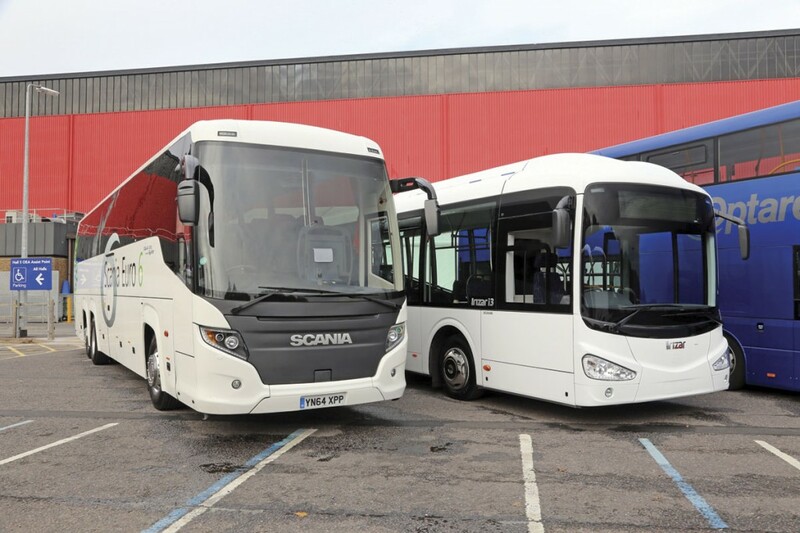 With the greater capacity of the Enviro200 which now covers the range between 8.9m and 11.8m, the decision has been made that the Enviro300 will in future only be offered as a body on Scania or Volvo chassis, not as an integral in its own right. Half of the stand was devoted to the Plaxton coach range with three models displayed. With a 73 seat interior trimmed in red and cream leather was the Volvo B11R 6×2 mounted Elite-i of Acklams coaches of Beverley. Illustrating the latest Panther 3 styling on a Volvo B11R Euro6 chassis was a 12.8m 53 seater for Maynes Coaches which had an impressive unladen weight of only 12,784kg. Completing the array was a Leopard body on a 12.8m Volvo B8R for Andersons of London. Most Leopards are 59 seaters but this was a 57 seater with three-point seatbelts and a courier seat. A major export order signed during the event was from the Kowloon Motor Bus Company (1933 Ltd) of Hong Kong. The £50m deal is for a further 200 of the new style Enviro500 tri-axle model taking KMB’s fleet of the type to 960 and total orders for it close to the 1,700 mark. The buses carry up to 137 passengers. 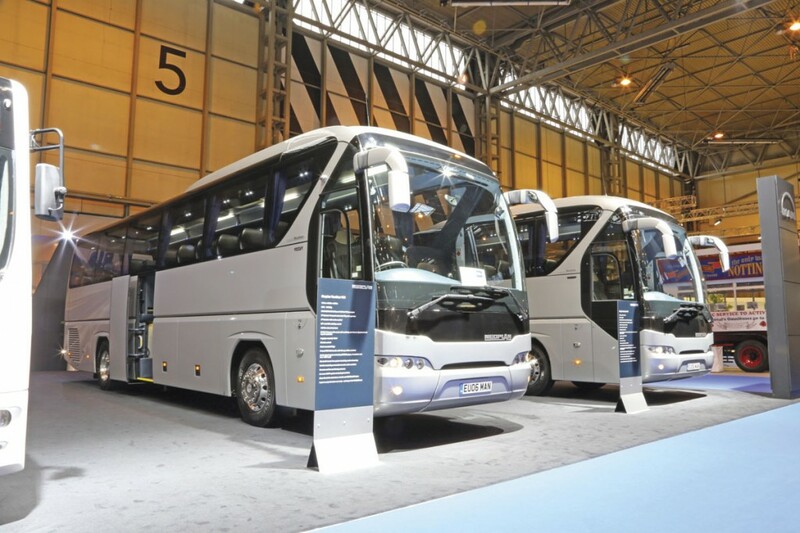 During the show it was also announced that Mistral Bus & Coach has ordered 34 vehicles from ADL worth in excess of £4m. The two businesses have recently signed a three year agreement to work together in the retail coach and bus market to offer customers an inclusive service covering both vehicles purchase and finance/rental options. The new order covers 24 Euro5 Enviro200s and ten new Cheetah XL mini-coaches in advance of the formal launch next year. 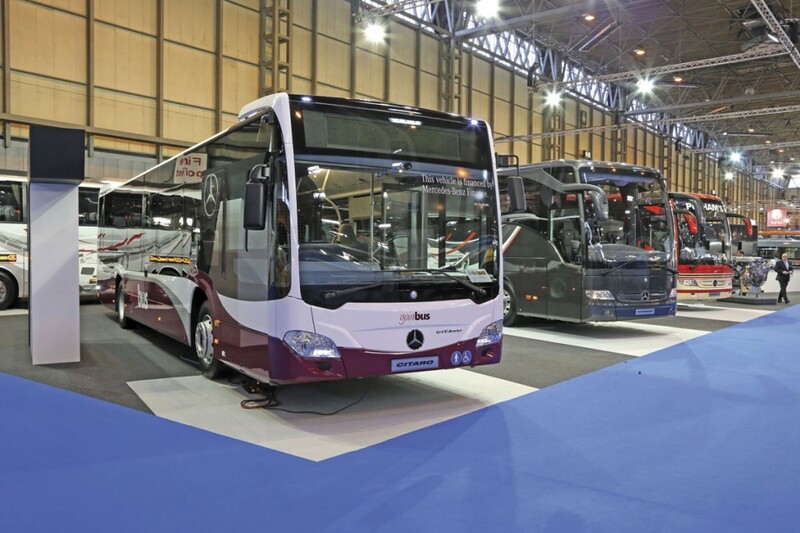 Arriva’s stand was in immediate proximity to that of Van Hool, reflecting the close working relationship between the two companies and the fact that the Belgian manufacturer’s fully integral products are now exclusively available through Arriva. On the stand was a 12.2m Van Hool TX15 Alicron with 49 black and cream leather trimmed recliners, courier seat and rear offside saloon toilet. It was powered by a 368hp DAF MX11 engine with ZF Ecolife automatic gearbox and painted in the colours of BM Coaches. Representing the Temsa brand was a 12.2m Safari HD Stainless Steel in the colours of Tourmaster of Crowland, a coach that was delivered earlier this year. It had 53 seats and a toilet, nine cubic metres of luggage and was powered by the DAF PR360 Euro5 engine. ‘A small handful’ of Euro5 Temsas are still available to buy. On the bus front, Arriva continues to work with VDL. A small number of Euro5 MCV single door buses are still available and for Euro6 the plan is to put an SB200 MCV demonstrator on the road as soon as low carbon vehicle certification has been obtained. A recent additional recruit to the Arriva fold is Dave Gregory who was formerly with MAN and will cover the Midlands and the North. In the past two years the size of the team has grown by 25% from 48 to 60, most of them in customer facing roles. ‘We are putting in the resources to drive growth. It’s happening, it’s not a plan any more,’ said Steve. MobiPeople is a Portuguese manufacturer based in Coimbra that developed following the closure of the Marcopolo manufacturing operation in the city. After the failure of the Spanish Tata Hispano operation, which had been supplying the Intea model, BASE turned to Mobi People seeking an entry level 70 or 57 seater and a new midi option. The result is the Explorer, mounted on the MAN RR8 chassis (formerly A91) and the Midi Explorer on the TGL chassis (covered in our Mini/Midi review), both of which debuted in Birmingham. The Explorer is 12.49m long, 2.55m wide and 3.45m high (including air conditioning) with a second door mid way along the nearside and over eight cubic metres of underfloor luggage capacity. It was shown as a 70 seater with a 3+2 layout featuring three point belted Prime Buckingham seats, the treble seats being located on the offside. The first two have been ordered by Baileys of Newbury and it was one of these that was on the stand. A price of £160,000 is envisaged for a 70 seater though it will be possible to specify a 57 seater with Vogel three point belted seats and ten cubic metres of luggage for £172,000. I thought the front entrance, finish and practicality were good, a minor criticism being the extent to which the centre stairwell intrudes into the aisle. The BASE team had already identified this as an issue and will be specifying future Explorers with a Z-step arrangement to overcome it. The RR8 chassis has the 6.7-litre MAN D0836 293bhp engine and the ZF Ecolife 6AP1200 fully automatic six-speed transmission. The presence of Barbi was a genuine surprise to me, indeed BASE had to rearrange their stand to accommodate the 10.35m MAN RR2 mounted Galileo HD coach. Barbi is an Italian family coachbuilding concern whose products were usually mounted on Volvo chassis prior to the creation of the new strategic partnership relationship with MAN around a year ago. They are noted for their high quality finish. Readers may remember that a Volvo B7R mounted small coach participated in the Coach Euro Test in 2009 when the Volvo B13R 6×2 Plaxton Elite also took part. Three Barbi models are to be offered. In addition to the 10.35m Galileo HD, there will be the 12.2m Galileo HDL, also on a two axle MAN RR2 chassis, and on the three-axle RR4 will be the 13.8m long Galileo HDH. The first HDH will be joining the associated Holmeswood fleet during 2015 and will provide 61 seats, a toilet and 20 cubic metres of luggage capacity. The RR2 has the 400hp engine and ZF AS-Tronic transmission while the RR4 has the 480hp engine. The Aspinall family see the Barbi as ‘a product for those for whom good is not enough.’ Prices are roughly £15-£20,000 more than for a Beulas, in part reflecting the higher specification. 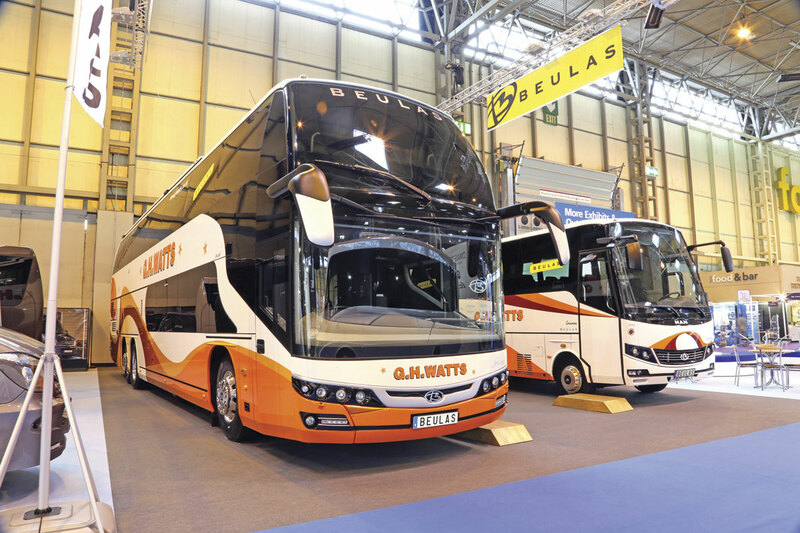 Beulas has been represented for the last ten years by BASE, during which time over 100 coaches have been supplied to UK operators, with one ordered as recently as last week. The marque will in future be handled by the associated Moseley companies although the NEC stand had been organised by the Beulas company. It featured two vehicles, one of which was a left hand drive Gianino midicoach on an MAN chassis. Dominating the stand, where Alan Wilson had come out of retirement at the age of 73 to act as UK Commercial Director for Beulas, was a double deck Beulas Jewel coach on an MAN RR4 chassis with 480hp engine. Carrying the colours of G.H.Watts, the Leicestershire operator, it was 13.9m long, 4.0m high and accommodated 83 passengers plus courier and two tables. Twin staircases were fitted along with a toilet compartment on the lower deck. Beulas coachwork is to be primarily offered on MAN chassis. ‘On MAN we anticipate offering the majority of the range,’ said Karl. He also confirmed that there would be VDL options ‘on selective models’ but not until 2016. The Mythos and Glory overdeckers and the superhigh Aura were mentioned. 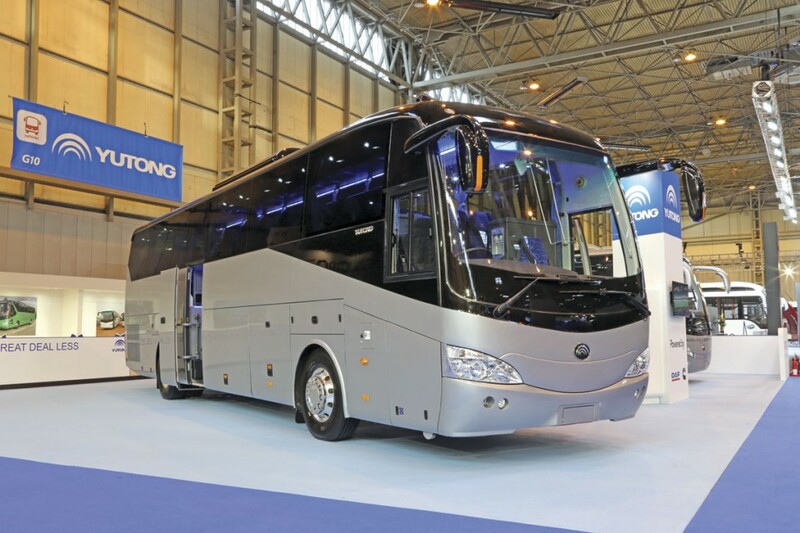 EvoBus have really got the bit between their teeth this year and were showing a number of variations to the Tourismo coach range, some with new options designed to extend its appeal to a wider audience. Foremost amongst these was a two-axle 12.14m example with 42 Luxline seats featuring rails beneath to prevent luggage sliding about, two Frenzel Club tables with rotating drinks holders, LED reading lights, power sockets/USB points on all seats, a new low mounted offside driver’s mirror and an offside rear saloon mounted toilet. Produced in house, the new toilet option is thought to be the first on a high floor Tourismo. In the familiar colours of Pulhams Coaches, who earlier this year took the first two examples, was a 13.0m tri-axle Tourismo M RHD16 with 53 Luxline recliners and a centre toilet. Similar to the earlier coaches, differences included a high mounted rear camera, additional wood effect to the dash and grab handles and pleated curtains, the latter set to become the standard specification. 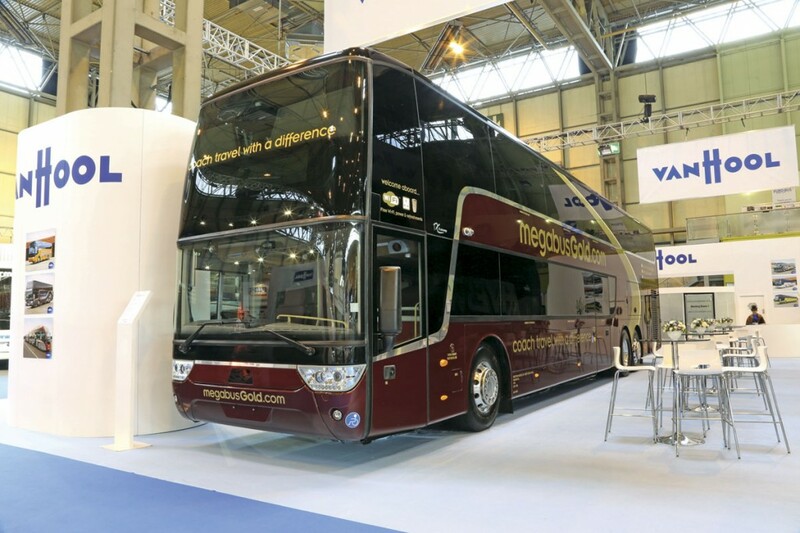 The third Tourismo on the stand was a 12.14m 55-seat example to a DDA compliant accessible specification similar to ten recently delivered to Dublin Coach. 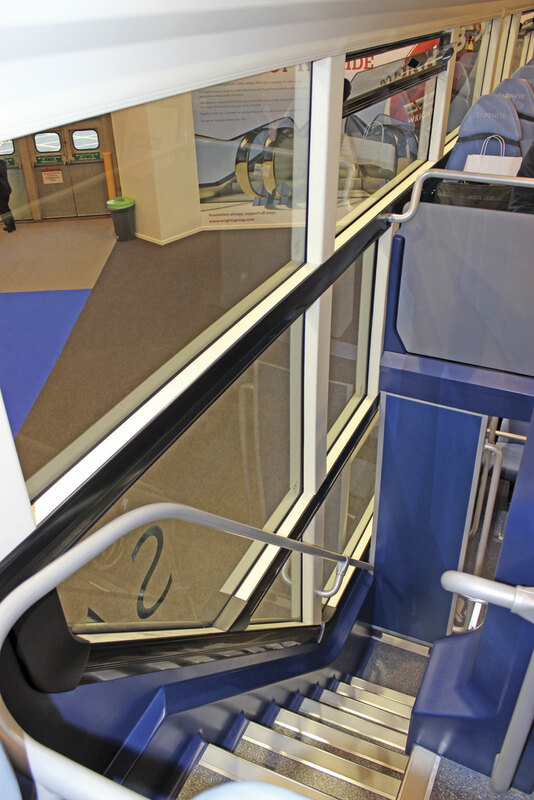 Equipped with a Kinemax lift, it was the first to have seat bases in the wheelchair bay area that can be slid out of the way rather than having to be demounted to enable a wheelchair to be carried. A ZF Ecolife gearbox was fitted. Three further Tourismos could be seen in the demonstration park. Representing the bus side was a 12m Citaro in the purple colours of Your Bus. One of a batch of ten provincial specification buses with wood effect flooring, it seated 38 with 32 standees. An example for McGills appeared outside. Another recent Citaro order will see ten high specification 12m buses delivered to Blackpool Transport in March. Announced during the show was an order from Edwards Holidays for ten Tourismos and the first three Caetano Levante Mercedes-Benz OC500RF2543 tri-axles for National Express duties. Another significant deal saw Dawsonrentals place an order for ten Tourismos for its spot hire fleet. Five will have 55 recliners and five will be 51/53 seaters with demountable toilets. Higer Bus only showed the one vehicle which will be covered in our mini/midi review but they did reveal that a 12m coach model is to follow in the first quarter of 2015 along with a 13.6m tri-axle design. These will have facelifted body styling and feature Cummins engines with other components from ‘top line producers’. Structurally they will be dipped for protection and will also have Dinotrol applied in key areas. The intention is to have a comprehensive support network in place. Having just celebrated 125 years in coachbuilding at the recent Madrid Show, the Irizar UK team were still in party mood, having sold their 125th coach in the UK, to Stewarts of Mortimer near Reading. They were showing three very different variations of the integral i6 coach. New is a 10.8m long, 3.5m high (plus air conditioning) version which was shown with 43 recliners and courier seat. Power is from the DAF MX11-271 Euro6 unit developing 368bhp and torque of 1,580Nm, coupled with a ZF AS-Tronic transmission. 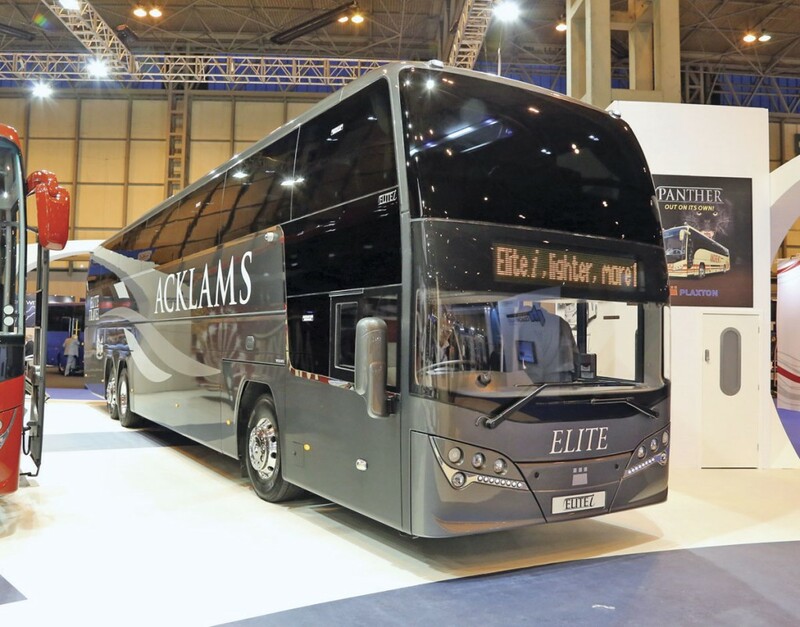 The new midi i6 had been ordered by Ellisons Coaches as had the largest of the three exhibits, a 13.87m tri-axle with 53 generously spaced leather trimmed seats and the DAF MX13-340 465bhp Euro6 engine. The third exhibit was a two-axle 12.9m coach with 56 seats, centre sunken toilet and the same driveline as the 10.8m. An additional model is to be made available next year: a 13.2m, 3.7m (plus air conditioning) i6 on three axles with 57 seats and centre toilet. The previously mentioned 125th UK sale is of this model, one of a pair Stewarts are taking. 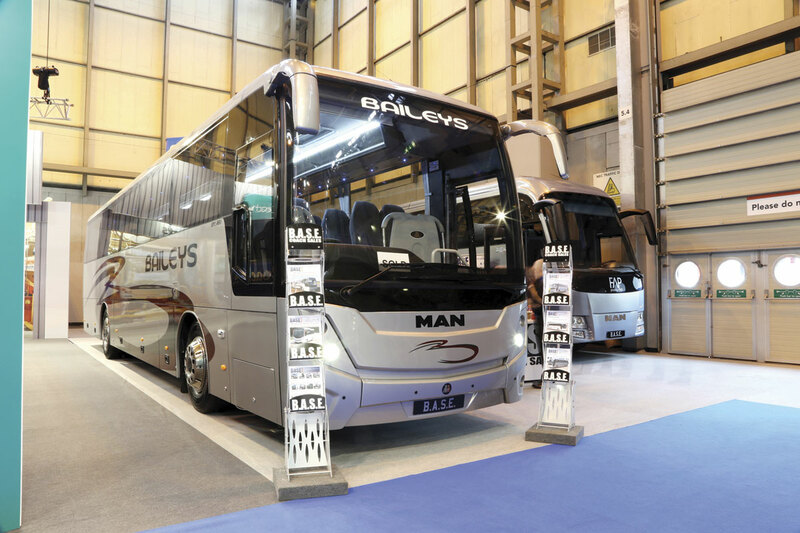 Fleet orders are more of a rarity than they once were so Ellisons Travel of Merseyside signing up for ten more coaches at the show, taking their total order to 13 was quite a coup for Irizar UK. It is their biggest order to date. To be delivered in the second quarter of 2015, they will be a mix of 12.9m two-axle and 13.8m tri-axle models. An early order for the new 10.78m i6 will see two delivered to Buzzlines. 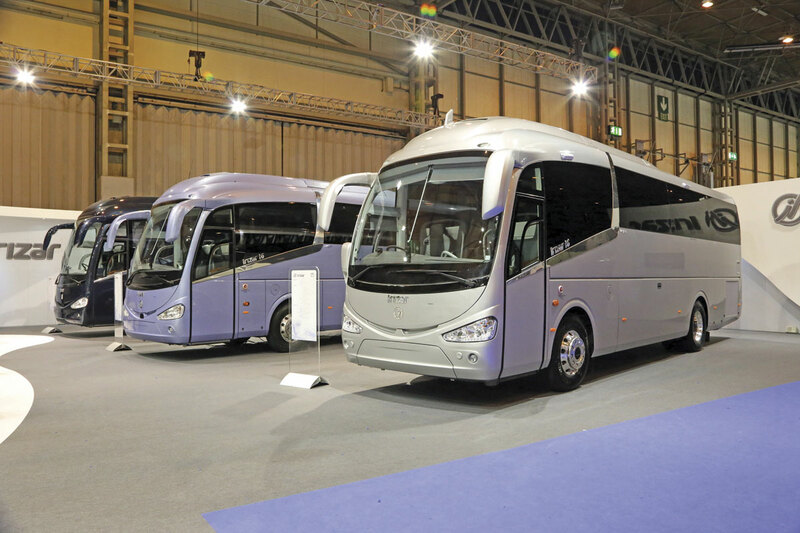 Speaking to Gotzon Gomez, Irizar Export Director, he said that overall in Europe Irizar would produce similar numbers in 2014 to 2013, around 1,100 of which 10% would be integral. There were already integrals running in Denmark that had covered in excess of 400,000 km. He told me of a new version of the i6 for the USA that will have a longer wheelbase and shorter overhangs as well as a Cummins/Allison driveline. A well known face in a new context was that of former EvoBus UK MD, Jan Aichinger, who is now the Head of Sales Bus Regions & International Key Accounts for MAN Truck & Bus AG. On the stand were two well known Neoplan Tourliner models, the two-axle P21 and the three-axle P20, both fitted with D2676 Euro6 engines and 53 recliners (though of different types). Also shown was the Nu-Track Pulse bodied MAN TGL truck chassis which has the potential to be a contender in the void left by the disappearance of the Vario. It was shown as a 33 seater though its capacity can be somewhat greater at up to 40. It has the four-cylinder 4.6-litre D0834 engine and MAN TipMatic (ZF AS-Tronic) transmission. I understand that there is considerable interest from customers such as the London Boroughs for school transport applications. To basic specifications the price is under the £100,000 barrier. Jan confirmed that MAN had so far taken orders for 38 TGL chassis for bus use in the UK. He also reiterated what I had learned from BASE about the imminent launch of 12 tonne TGL based options in conjunction with MobiPeople. Jan also said how pleased he was to have won a contract in Bahrain to supply National Express with 128 buses. The vehicles are 88 10.6m MAN A66 with Caetano midibus aluminium bodies built using Hess kits and 40 MAN RR2 chassis, also with Caetano bodies, some of which will be 12.3m long and the others 12.8mm long for airport express work. Jan believes the Middle East is one of the markets with the biggest growth potential. Judging by the orange and green colour of the exhibits, Optare’s stand had been ‘Tangoed’. 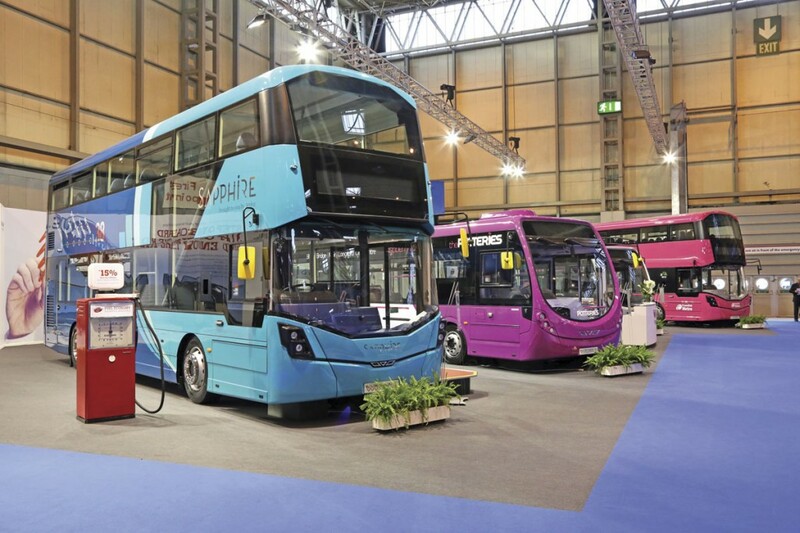 Three vehicles were displayed and in addition there was a set up demonstrating the working of Optare’s electric buses. Completely new was the first single door example of the MetroDecker double deck which was unveiled earlier this year in two door form and appeared in this guise in the demonstration park. Powered by the Mercedes-Benz OM934LA engine, it has a ZF EcoLife transmission. A very different approach to the emergency door has been adopted on the single door bus, with the aperture left by the removal of the second entrance utilised rather than the customary offside rear position. It looks a little unusual but no more so than offside doors in the low floor area of single deckers did when they first appeared. A spiral staircase is fitted. I still can’t work out how they have managed to get the weight of it under 10-tonnes. No orders have yet been placed for the MetroDecker, the order book only having opened at the show. Also on the stand were two other single door buses, a Solo with 30 seats and a MetroCity single decker. Optare plans to major on the MetroCity rather than the Versa in this sector though the Versa remains available as a premium product. The MetroCity is some 200kg lighter. Both are initially available at Euro6 with the Mercedes-Benz five-litre engine but it is anticipated that the Cummins option will also be available with effect from the second half of 2015. Euro5 options are still offered from both manufacturers in each member of the single deck range. 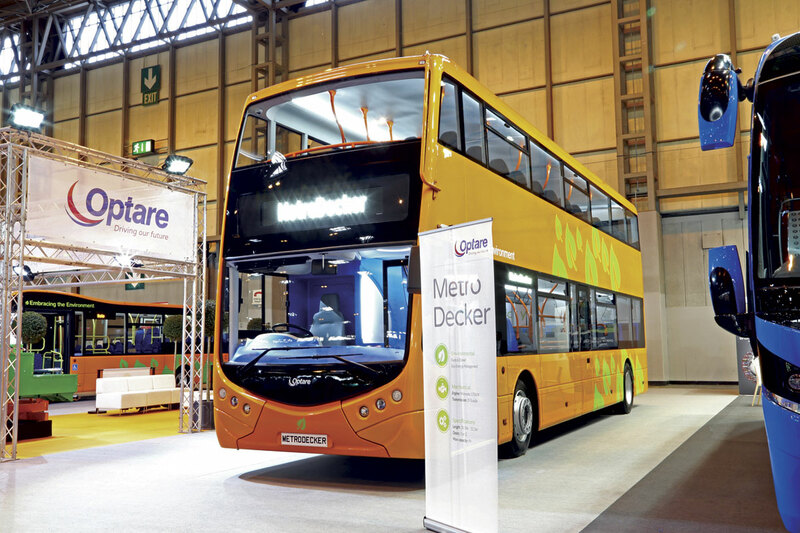 Export successes include 21 Tempo single deckers and a double decker to Australia, where Optare has grown to take a 10% market share over the past 18 months. Although not heavily promoted the Tempo does remain available in the UK. More recently, Optare has won an initial order from National Express for 14 7.5m Solos for use in Bahrain. They will enter service during the third week of February. Somewhat bizarrely, Scania did not have any complete vehicles on its stand, only a single engine. This was the more odd as it had three new products to the market available for viewing in the demonstration park outside the main hall. These were the first Chinese built Higer Touring 57 seater for the UK on a K410 6×2*4 chassis and a 12m Scania K250UB 4×2 mounted Irizar i3 with 39 Kiel Indigo seats and quite a sloping floor line at the rear of the saloon. The third novelty was a 12m Scania K Series 4×2 Van Hool Alicron TX15 49-seater loaned by Westward Trucks of Ireland but similar to those that will be offered by the associated Moseley group of companies. It had an unladen weight of 14,300kg. Orders placed at the show included two 13.9m Scania Irizar i6 57-seat coaches for Paul Winson that are similar to one bought earlier this year. They were purchased on the basis of positive driver and passenger response coupled with good service. Appearing in the colours of Coopers of Killamarsh, who do not anticipate taking delivery of it until March next year, was the first right hand drive TAM Vive TH. This is a 10.2m long, 3.5m high luxury coach that will be marketed through Pelican Engineering, the company that is also handling the Yutong product in the UK. In the past TAM midicoaches weren’t very pretty but this is well proportioned and attractive. It was also quite well finished, with 38 Innova leather trimmed seats and an optional Glova rear offside saloon toilet, though a straight seated version could accommodate 41. I thought the rear nearside corner seat was short on shoulder room but this should not be difficult to remedy as there is space to move the whole double seat towards the centre. The engine fitted was the Euro6 MAN D0836 rated at 290hp although a Cummins ISB6.7 is an option. Other key components are ZF including an EcoLife automatic gearbox, 8098 Servocom steering and RL75 and AV132 axles. Stock vehicles will have 41 seats and retail at £159,900. The German built toilet option adds around £5,000. A two year bumper to bumper warranty is included. Two other coach models are available, both with the same driveline, though there are no immediate plans to offer either. One is the 10.2m TL which is 3.235m high and has less luggage capacity and the other is the 11.5m TLL for school bus applications with 45/46 seats. However, there are plans to bring in a fully low floor electric bus with a range extender that is currently under development and expected to be available in the first quarter of 2015. Available in lengths between 7.25m-10.5m, it has no air tanks and a small (one-litre) engine that charges Swiss FIAM Nickel Sodium Chloride batteries. A rear steer facility enables it to turn well within its own length. TAM is based in Maribor, Slovenia and can trace its origins back to 1947. For many years it built Magirus Deutz products under licence but is now owned by Chinese backers. Today, in addition to its coach products, it builds city buses and is increasingly strong in the airport bus sector which it now claims to have 35% of, having sold 125 this year with either Euro6 MAN engines or Euro3-5 Magirus TCD units. Sinan Ogun, once of BMC, is a member of TAM’s supervisory board and former MAN employee, Holger Postl, is the CEO. Shown by Van Hool in its own right were three TX family coaches, the most imposing among them being a TDX29 Astromega sleeper coach from the Stagecoach Megabus Gold fleet. Measuring 14.96m long, it had the DAF MX340 engine and ZF AS-Tronic 12AS2301 automated transmission. The seating capacity is ten on the lower deck and 38 on the upper. In Eavesway colours was a 14.4m TX21 Altano with DAF MX340 462hp engine. 52 passengers can sit on the upper deck and a further three in the lower deck cabin. The third exhibit was a 13.2m TX16 Astron for Shaws of Whitley, featuring large eagle images on each side. Equipped with 53 seats it had an unladen weight of 16,800kg. Again it was powered by the larger DAF MX13 unit rated at 462hp in conjunction with the ZF AS-Tronic transmission. Two VDL Futura 2 coaches to very different specifications appeared on the VDL stand. One was an FHD2-129/370 carrying the traditional red and cream of Safeguard of Guildford who celebrated their 90th anniversary earlier this year. It had 57 Vogel Conturo seats. 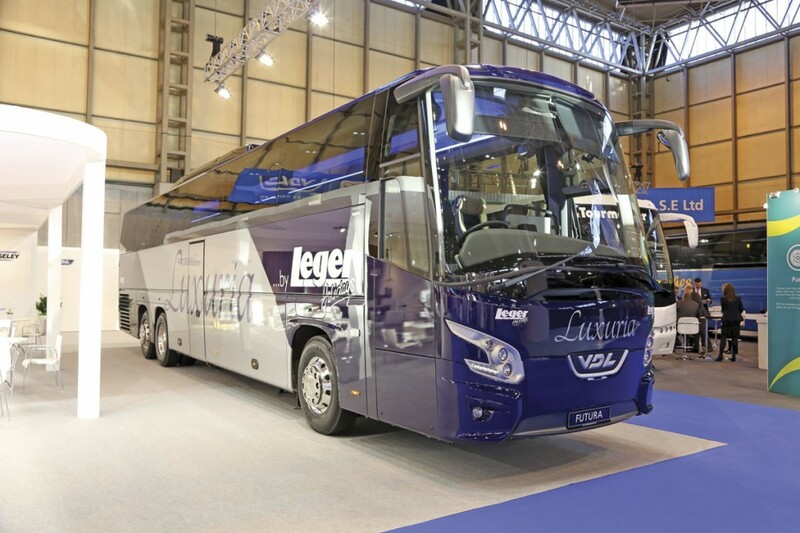 Generating a great deal of favourable comment was the second coach on the stand, a tri-axle 14m Futura FHD2-139/440 purchased by Skills of Nottingham for use on contract to Leger Holidays in their new Luxuria colours for the highest quality tours. It features only 31 VDL class 500 2+1 recliners, which makes it exceptionally spacious and comfortable. Every seat has its own Funturo on demand entertainment centre. Passengers travelling on tours with the coach will pay £10 a day over and above Silver Service rates. With a fully flat floor and tracking already in place, the idea is that the coach can be reseated for a second life after its touring days are finished. 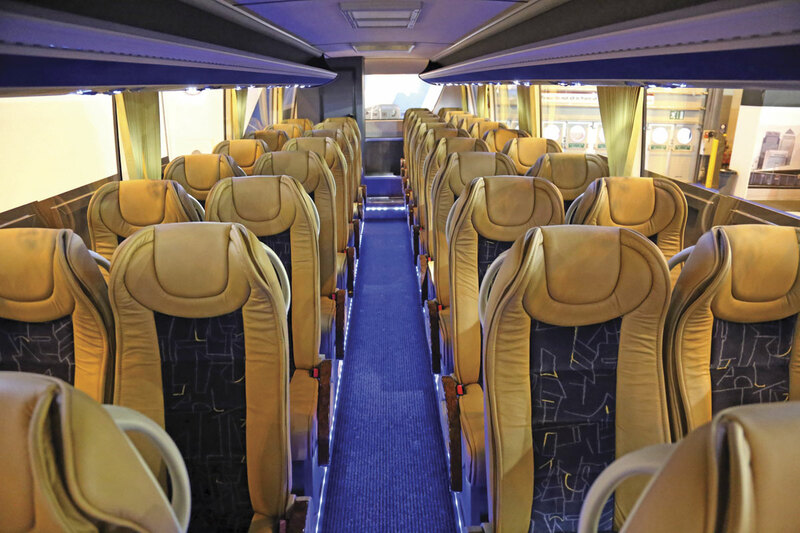 It is thought that VDL has not supplied 2+1 seating in the UK before. We have already extensively covered Volvo’s range and plans at a pre-show event and, as promised, the stand featured an unbodied B5TL chassis with 5.1-litre D5K four-cylinder engine, a 9700 6×2 coach and a Euro6 7900 Hybrid in the colours of Lothian Buses with the same engine used in the B5TL. It was announced during the event that Volvo Bus and Lothian Buses have agreed to introduce 24 plug-in electric hybrid buses onto the route between Musselburgh and Clovenstone in Edinburgh. There will be recharging stations at each terminal enabling extended battery-only operation. It is anticipated that the bus will use around one third less diesel than a hybrid. They will also be equipped with geo-fencing that enables the buses to be controlled so that they automatically run in zero emission mode in air quality sensitive areas and their speed is limited near schools. They are expected to be delivered during 2016, once series production of plug in hybrids is underway. 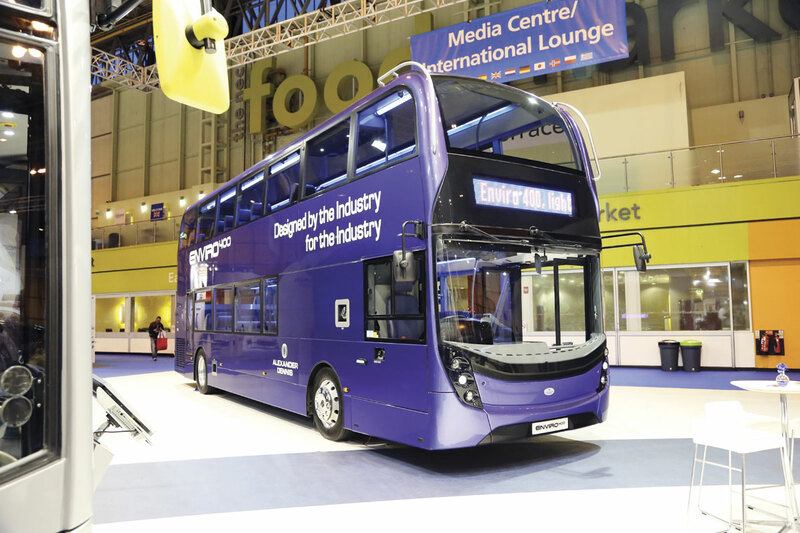 Like Volvo, Wrightbus had staged a detailed pre-show press conference to impart its latest developments though the show was the first opportunity I’d had to see the latest models in the flesh. I picked up a mixed reaction to the new StreetDeck/Gemini 3 styling although my own thoughts are that it is a good look and one that takes the product forward. I really liked the effect created inside the bus on both decks by the glazed staircase arrangement, though I did find the upper deck corner pillar mouldings rather thick and heavy in appearance. The StreetDeck, powered by the Daimler OM934 four-cylinder engine and complete with high standard interior, was shown in the Sapphire livery of Arriva who will use it on Route 38 between Sinfin and Derby City Centre. Exactly the same style is used for the latest generation Volvo B5TL chassis mounted product, the Gemini 3. It was shown in the (am I allowed to say dreadful) all over pink livery of Translink in Northern Ireland. The two other buses exhibited were both Streetlite single deckers. In the Raspberry Route livery of the Potteries operation of First in the Midlands was the first 11.5m Streetlite Max Door Forward version for First to be equipped with the Euro6 Daimler OM934 5.1-litre engine. The second Streetlite was a Cummins powered Wheel Forward model in demonstration livery. Vying with Daimler to be the biggest producer of buses in the world, Yutong is a serious world player and has impressive anti corrosion treatment facilities at its massive manufacturing plant as well as a state of the art research and development centre. In the UK it has teamed up with Pelican Engineering of Castleford to offer a range of products including nine and 12m coaches initially. On the stand was the first TC12 Euro6-powered 12.28m long, 3.8m high coach. Pelican has already imported and sold 21 Euro5 TC12s with Cummins engines (though some have still to go on the road) and for Euro6 is switching to the 10.8-litre DAF MX11 unit rated at 400hp. This is coupled with a ZF EcoLife fully automatic transmission. A variety of seating capacity options are offered, the show vehicles having 51 recliners and a centre sunken toilet. Luggage capacity to this specification is eight cubic metres. The retail price is £192,000. 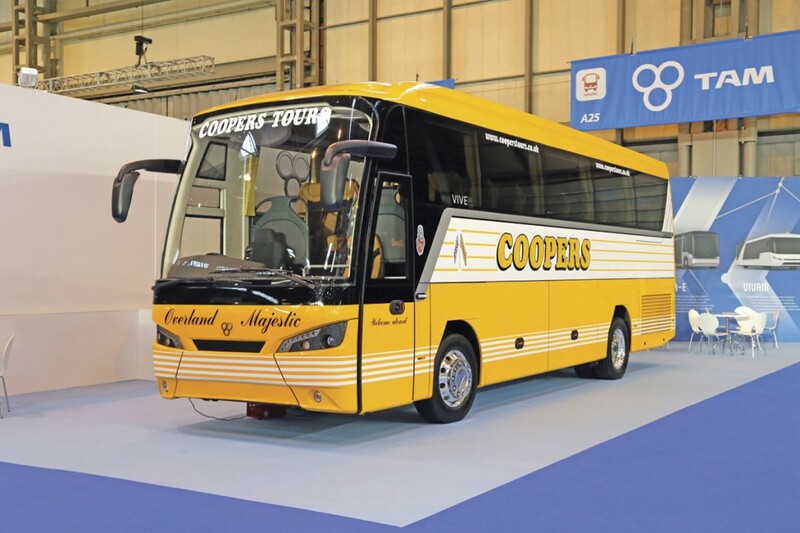 The first company to order a Euro6 TC12 is Cropley Coaches of Fosdyke in Lincolnshire, who were also the first customers for the Euro5 model. The TC12 appeared alongside a TC9 midicoach that is covered in our midicoach review.